IP addresses of ETH 0/1 and ETH 0/2 on Router A are 172.16.1.128/25 and 172.16.1.1/25 respectively. 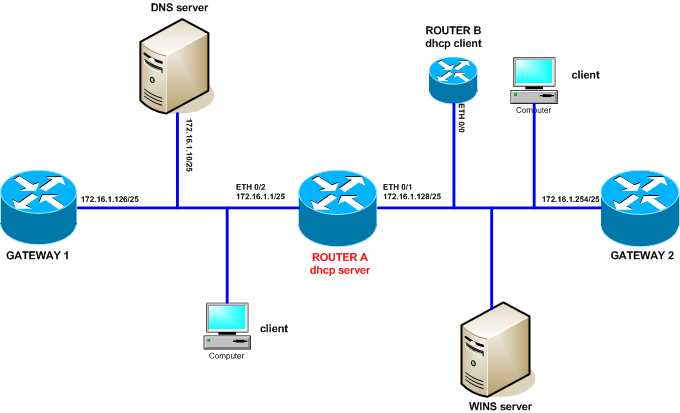 Router B (dhcp client) obtains static IP address, gateway address and DNS server address from DHCP server (router A). A MAC address of interface ETH 0/0 of router B is 0800-6902-01FC. DHCP server assigns IP addresses to clients in subnet 172.16.1.0/24 subnetted to 172.16.1.1/25 and 172.16.1.128/25. DNS server address and WINS server address are 172.16.1.10/25 and 172.16.1.200/25 respectively. For subnet 172.16.1.128/25 configure DNS server address, WINS server address, gateway address and address lease duration for 6 days and 6 hours. For subnet 172.16.1.1/25 configure DNS server address, gateway address and address lease duration for 10 days. After the whole configuration is completed Router B gets 172.16.1.150 IP address from DHCP server. All remaining DHCP clients obtain IP addresses and other network parameters from either 172.16.1.1/25 or 172.16.1.128/25 networks (depends on subnet which they reside in). Display dhcp server ip-in-use command shows IP addresses assigned to DHCP clients.